Darling Bakery Sign. Don't fret painting the details on the cake.. they have been carved into the wood, just brush a bit of paint across the scribed design and you're finished! Measures 2" high x 2 1/4"" wide. 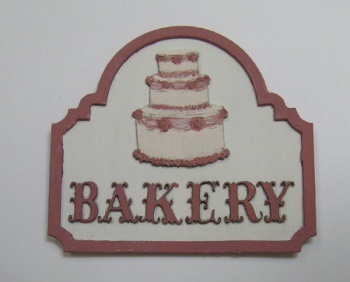 In this kit, you will received a laser cut wooden base on which to assemble your sign. Simply paint this base with an acrylic paint of your choice. Additionally, you will receive a wooden laser cut scrolled frame or border, silouette, and lettering. Simply paint these items in a second color of your choice. Then glue them into place onto the base. We have even made that part super easy for you... the placement of the lettering, silouettes, etc. has been lightly scribed into the base piece, so no guesswork involved. Just glue the letters into their marked position. If you prefer, all designs can be done in a stained finished.